Sky is a central character in VayneLine who is part of Gauge’s crew, he is young, idealistic, friendly, formerly rich, and a skilled Gun-Drift athlete. He is one of the two most out-going members of the crew (the other being Roza) and people joke that he could be friends with anyone. His full name is Sky V Lixnia Angel. 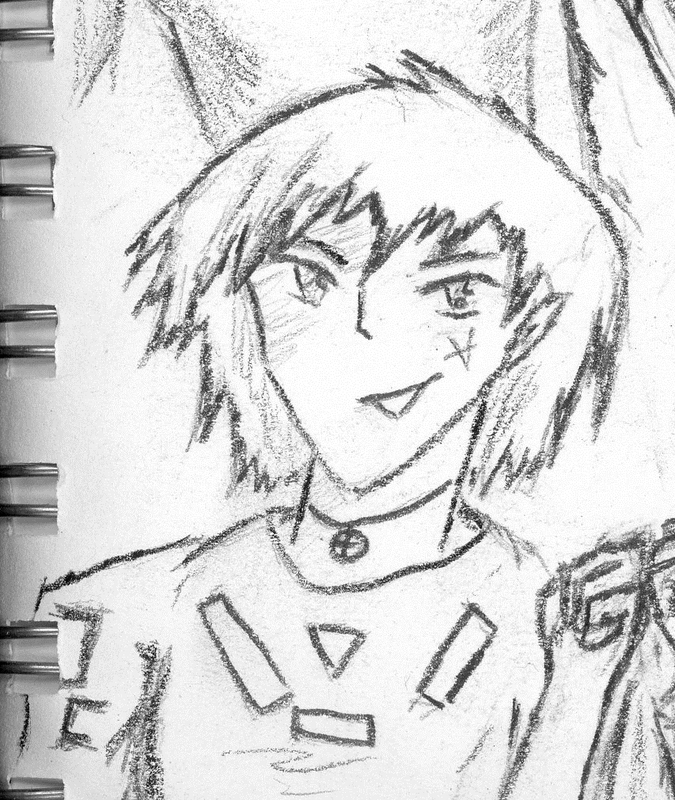 Sky – A young, idealistic member of Gauge’s team. Is largely against violence and is religious. Surprising athlete. Sky comes off as a very casual guy who is more interested in having fun. He is not super open about it but has strong religious inclinations which he shares with Arianna. Many of the crew think he is pacifistic, so it is ironic his preferred melee weapon is the Render (a type of handheld chainsaw/knife). Everyone thinks it is for show. Sky joined around the time the second group joined after the original 4 (and Fade) escaped from Terra. He was independently wealthy, both from a back story involving his family as well as making a lot of gems on Gun-Drift. Sky is one of only two people on the crew that gets along with the mercenary Felix. Everyone thinks the friendship is very odd but there is a reason they do. Sky was a single child raised in a very wealthy family. He is rare in that he was both born, but it was an Affiliated colony (which is why he bears the ‘V’-like Strive). Originally he had little conception of money or ‘want’. Having tried to give a gem to a beggar was yelled at by his father. Sky eventually runs away from home with a large jar of gems (which is a sizable amount of currency) he is attacked and robbed by a young girl. She is surprised by how weak he is, she hates him at first but is curious about his life so different from hers. Named ‘Lixnia’, she gives him a bet that for every day he stays away from his parents he will earn 1 gem back from her. Being somewhat hard-headed (and very naive as he fully admits later) he vows to earn them all back. In the process he falls into her group which is somewhat criminally bent and is a rising Gun-Drift team which he takes a very good. Lixnia gives Sky the name ‘Sky’ as it was not his real name, but rather her middle name as was better as he was ‘pure’ unlike her. Later when he registers for Gun-Drift he reverses her name, so he registers under ‘Sky Lixnia Angel’ which the last part came from his group constantly giving him a hard time about how soft/nice he was compared to the rest. None of ‘Sky Lixnia Angel’ is his real name, he claims he doesn’t remember, but more than likely simply wants to forget his past. The necklace he wears is the same symbol as the Terra symbol (A cross in a circle) – he was not born on Terra.